Here we go. How to talk about a favorite film? It’s tough. I’ll have you all know I watched it 3 times for this review . Once to enjoy, once with commentary and once to take notes. There are a lot of ways I could go with the review and even now as I am writing I’m not sure what way the words will take me but that wouldn’t be the first time in my blogging career and it won’t be the last. 3. It marked the return of the broadway style Disney musical which hadn’t been seen since Cinderella. You certainly had pictures with songs, many by the Sherman Brothers but there weren’t any ballads or traditional scores like a musical. 4. Computer animation was used in a new way. Scenes like the ship scene at the beginning and the climatic battle were done using CGI, which had just been invented by Pixar. It is the last movie to use hand painted cells. But even so bubbles and other special effects were revolutionized to create the lush look of the picture. 5. 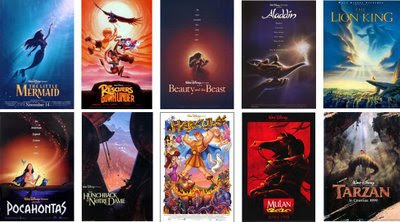 It would inspire Disney to keep on progressing in their animation quality and storytelling ability. The next decade is what is known as the Disney Renaissance where we see such classics as Aladdin, Beauty and the Beast, Lion King and others. Really Disney would face no competition until Dreamworks had it’s first megahit with Shrek in 2001. Pretty impressive. So that’s some of the 411 behind The Little Mermaid. Even if you are one of those poor unfortunate souls who doesn’t like this movie you can’t deny it was very important. As we discussed in the Oliver and Company review, Disney executives had gathered animators for a brainstorming session and green-lit the ‘oliver twist dog movie’ and the ‘little mermaid’. As I said, executives were skeptical could appeal to boys limiting your audience. However, they had decided to embrace the musical and Splash had recently been a big hit in live action for the studio. 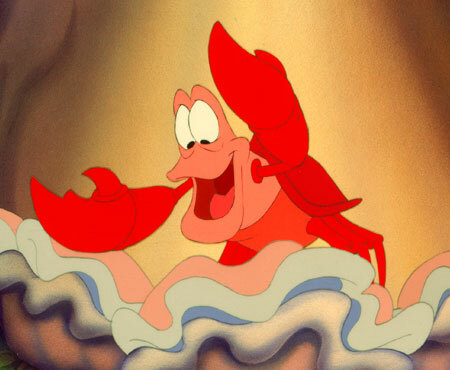 Walt Disney had actually thought about doing Little Mermaid as a package film of Hans Christen Andersen shorts. 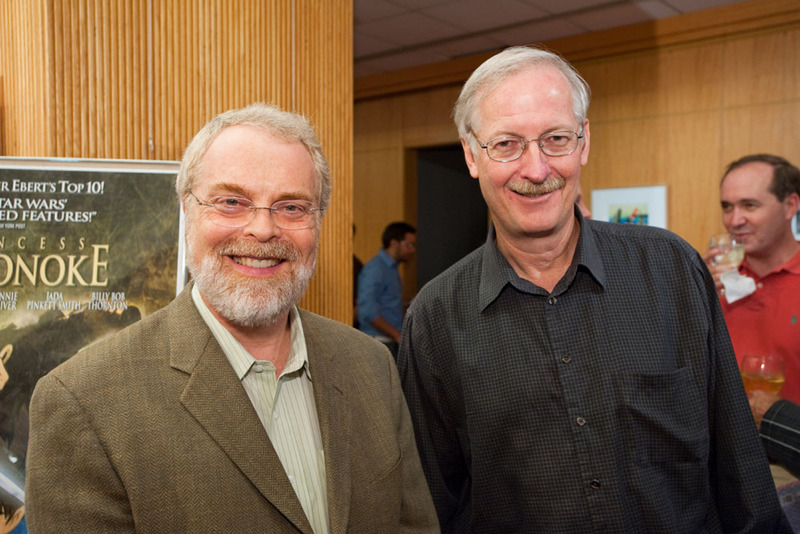 They had even commissioned some storyboards which 1989 directors Ron Clements and John Musker found and the changes they had made to the original story were largely the same as the 30s version (cool right?). In both cases the story had been softened from the book to have a happy ending. 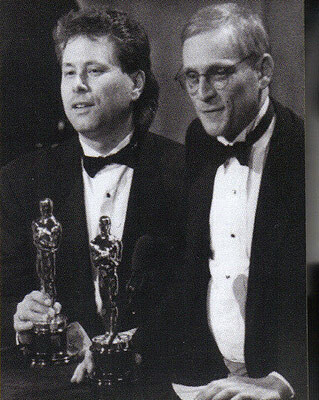 Once they had decided on a Broadway style musical they had worked with Howard Ashman previously on Oliver and Company and he had worked with Alan Menken on Little Shop of Horrors. If you ever get a chance listen to the audio commentary on the diamond edition dvd because I was amazed at how much influence particularly Ashman had over the film. He is even credited as writing ‘additional dialogue’. I figured he was just the lyricist but evidently he would preform each of the songs in costume and insist the animators and their body doubles (Little Mermaid used human forms for the first time in many years too) mimic his acting. Little Mermaid is also a movie that is ‘underscored’ meaning the music was written to dictate the animation, not the other way around. This also hadn’t been done in many years at Disney. For the first time in many pictures there weren’t any celebrity voices except for Buddy Hackett who played Scuttle. Jodi Benson who voiced and sang for Ariel was a broadway performer who had worked with Ashman before. Her and Samuel Wright who plays Sebastian did not audition before the main team but sent in tapes from New York and they were so impressed they go the jobs. Kenneth Mars who plays Triton had been a working actor but not well-known and Pat Carroll was a replacement for Ursula. They originally wanted Bea Arthur from the Golden Girls. I’ve mentioned on the blog how much I admire Walt Disney Studios risk taking. Despite initial nervousness Little Mermaid was the most expensive animated movie ever made and with the flop of the previous expensive film, the Black Cauldron, you have to admire them for taking a risk again. The animation is so detailed. After decades of xerox films to have a million bubbles surrounding the characters under water, and the iridescent look of the light on the rocks is amazing. The light and shadows are stunning in the film. If you’ve never paid attention to the bubbles watch next time. Every inch is animated and bubbly! Even just the movement in Ariel’s hair is incredible. There isn’t a moment under sea where it is static. It always moves and flows. No small task even today. 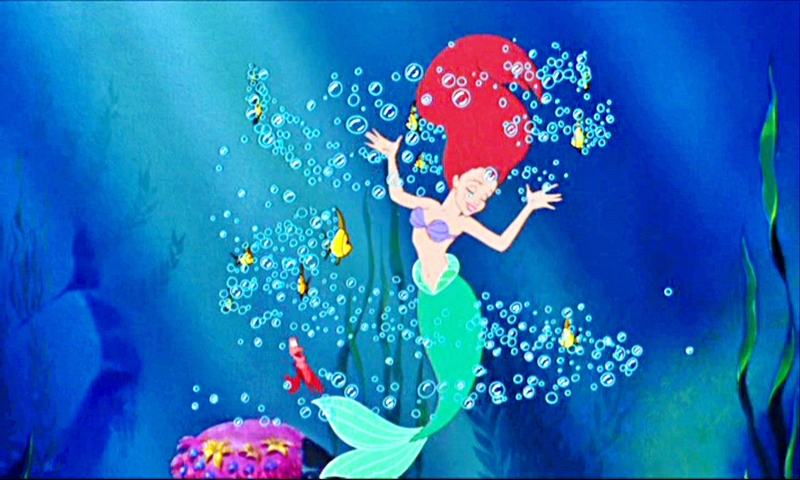 If you listen to the audio commentaries it becomes clear Little Mermaid was a labor of love especially for Clements, Musker, Ashman and Menken, and I for one am grateful because it meant a lot to me growing up. The Little Mermaid was also the first movie to be released on VHS only 6 months after it’s release. At the time Disney was very nervous about doing this because it would prevent profitable re-releases which they had done of their other classics; however, it was a huge hit selling 7 million in the first month! It also started a track record of Disney winning Oscars again (first nomination since 1977 Rescuers) with wins for best score and song (Under the Sea). They would win again in 91, 92, 94, 95, and 99. Not bad! Let’s talk about the story by going over the songs. We start out with Prince Eric’s boat and a sea shanty which introduces us to the myth of Triton and his ‘fathoms below’. Immediately we are immersed in the feel of the water and the melodies we will be hearing throughout the film. Then the melody takes us to Triton’s castle and the concert. We learn Ariel is headstrong and doesn’t come to practices. We meet Sebastian and Triton and get a brief glimpse at Ariel’s sisters. This scene is not only humorous but it tells us a lot of Triton’s relationship with Ariel. She is clearly the favorite of his girls and she isn’t there. This doesn’t just disappoint Triton but it angers him. That is a lot to learn about characters in what is essentially a comedic scene. Then we get to see Ariel. She is searching for human treasure and is willing to face a shark for it. She goes up to the shore to find out what the items are from Skuttle. Again this is a humorous scene but it also tells us a lot about her . She is brave (perhaps carelessly so), rebellious, inquisitive and naive. These are all huge traits that makes her vulnerable later on to the manipulations of Ursula. Triton is upset with her of course so he assigns Sebastian to take care of her. He a musician is insulted to watch over a ‘teenager’. Evidently Menken and Ashman decided on a Jamaican voice because reggae was very popular and they felt it would give a swaying feeling of the sea to Under the Sea and Kiss the Girl sung by Sebastian and I think they were right. Plus, it makes Sebastian an interesting character. Most characters with that accent are relaxed and chill but he’s high strung. It’s funny. 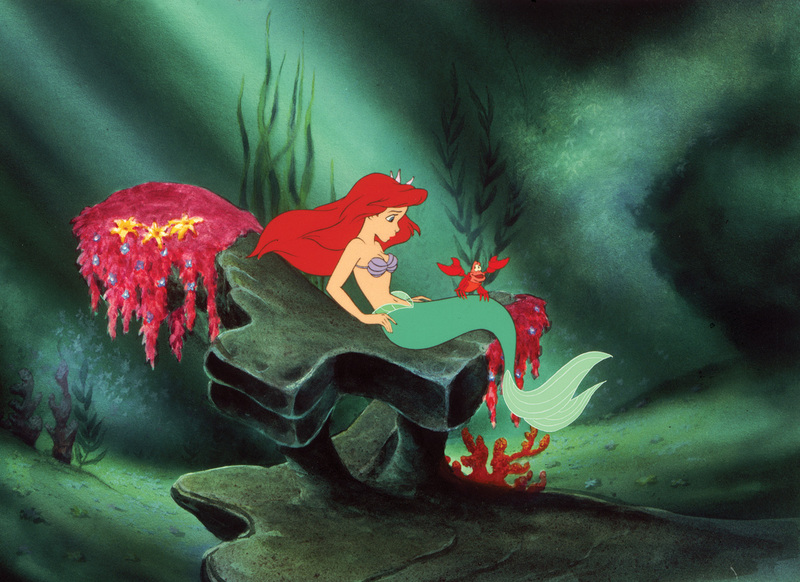 Sebastian follows Ariel to her secret grotto where she sings of her desire to be human, to be part of that world. Originally this song didn’t test well in focus groups but Ashman, Menken, Clements and Musker told execs neither did Over the Rainbow, so the song stayed. In the audiocommentary one of them says having Sebastian there during the song adds a level of tension and even suspense which helps tone down the cloyingness that might otherwise be there if she was unheard. I had never thought about it before but it makes sense. I’ve heard some people object to Ariel because she is selfish and whiny. She can be selfish but where do you draw the line between knowing who you are and what you want out of life, and being selfish? She certainly does selfish things but it is from a good place. She doesn’t feel at home in her own skin literally. How many of us have felt the same? I certainly have and that’s why I related to the movie so much. I remember looking through my Mothers wallet and wishing I could be taken seriously by someone. I hated being a kid and being told what to do all the time. I wanted to try things my way and maybe that is selfish but it is also what produces great human beings. To me her yearnings come from a deeper place than just whining and complaining and I think it is why girls related so well to Elsa in Frozen too. It’s the same kind of yearning to be who you are supposed to be but the world won’t allow it. She hears some fireworks, leaves Sebastian, and heads up to see what the noise is about. 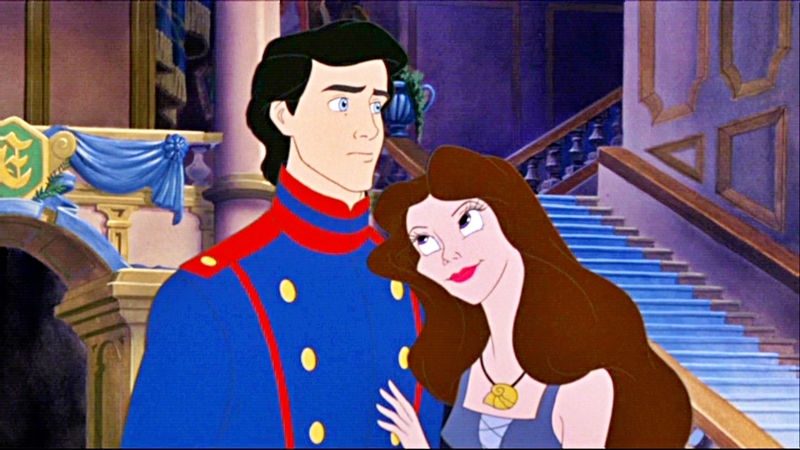 This is her first time looking at Prince Eric and she is immediately taken with him. 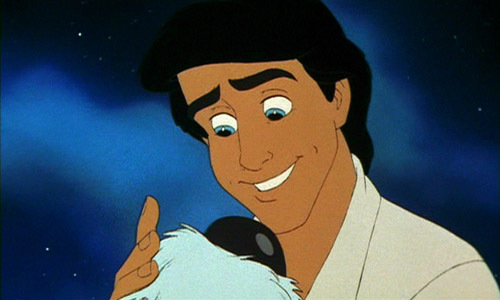 Eric is one of the most present Disney Princes. Evidently for some reason men are hard for the animators to draw and that is why they were avoided in films like Cinderella. (It’s strange but I’ve read that more than once). I know technically it is only a few days but for a Disney movie we get a lot of time spent between Eric and Ariel. He actually has a fair amount of dialogue for Disney Prince. We know he is waiting for the right girl despite his adviser Grimsby’s yearnings for him to settle down. They establish quickly Ariel and Eric are a match in spirit not just appearance (which is something the instant love trope usually misses. I have no problem with instant attraction but that should just be the beginning and with Ariel and Eric it is). An unexpected storm comes and Ariel jumps to Eric’s rescue saving him from drowning. We get a reprise of Part of Your World which is stirring and had every earnest little girl singing along! Again, I related to this song because I felt like Ariel- a kid who wanted to break out of the kid body and be taken seriously by the world. Her session with Eric makes her twitterpated and she flirts around the castle to the notice of her father and sisters. This stresses out Sebastian as he knows the King will be enraged if he finds out Ariel’s secret love. So Sebastian tries to convince Ariel that she should stop wishing to be on the ground. He then sings to her the Oscar winning song Under the Sea. The animation in this song is amazing. Every fish plays a different musical instrument and they all combine together for one sound. How they recorded it I will never know but everything from tubas to steel drums make for a great song. On the audio commentary they mentioned how the backdrops in under the sea are many colors. I guess Katzenberg was concerned they weren’t all blue but it totally works. In fact, the more creatures involved the more colors the sea is until we have seen purple, gold, green, pink and of course blue. And seriously watch the bubbles in Under the Sea. It is amazing! 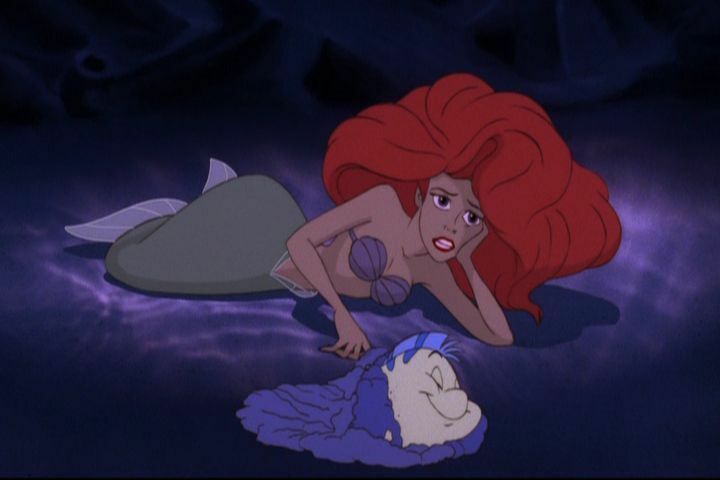 Of course she doesn’t listen and leaves with Flounder before the song is even over but Triton requests Sebastians presence because he wants to know who Ariel is in love with. By a slip of the tongue Sebastian tells him Ariel is in love with a human. Of course, he is angry and worried. 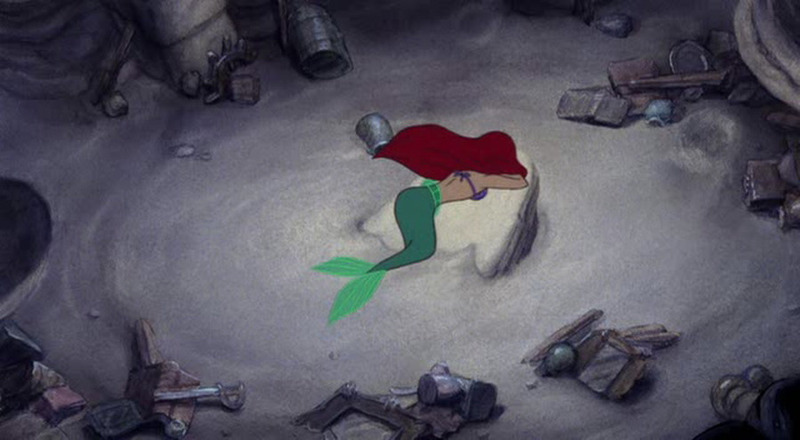 Fearing for his daughter and completely incapable of communicating with her Triton destroys Ariel’s grotto and leaves her devastated. Again think of this from her perspective- everything she knows in her heart she is to be has been destroyed and told is wrong. To me it makes perfect sense she would be vulnerable at such a moment to Ursula, the sea witch who sends her thugs Flotsam and Jetsam out to tempt her. The eels are basically like the snake in the Eden story and Ursula is the devil. Ariel is willing to sell her soul, her voice, to the devil for a chance to be who she is supposed to be, and love who she is supposed to love. That is compelling stuff in my book! From the moment we meet Ursula she is one of the great Disney villains. She is bitter, out for revenge, overweight octopus who covers the sea with her blackness. Pat Carroll as the voice gets the perfect balance of a truck driver with a drag queen and even the way she puts on lipstick is suspect. She is like a used car saleswoman but in Ariel’s case it is her soul and revenge on Triton Ursula must convince her to give up. Poor Unfortunate Souls is my favorite villain song ever (and only the second solo by a villain ever). Much copied but never duplicated, it has the perfect combo of gravitas, manipulation and salesmanship. 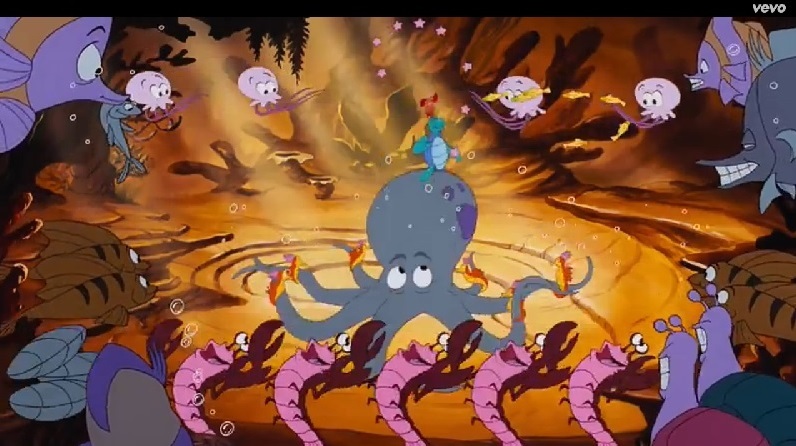 Once she is turned into a human Flounder, Sebastian and Skuttle must help her find some clothes (in a very well choreographed scene by Disney considering their heroine is without clothing! The score in this section is also brilliant highlighting every moment. I’ve heard some people say Little Mermaid teaches a bad lesson because Ariel gets what she wants in the end despite making very poor choices. 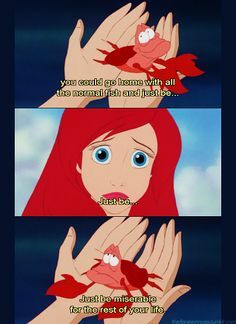 She does make mistakes and she realizes it when her father is taken down by them, but when she gets her legs Sebastian looks at Ariel and he says ‘or you could be miserable for the rest of your life’. Her father was never going to give her what she knew she needed and Ursula at least provided a chance. Eric meets Ariel and thinks she is the one but since she can’t speak he discounts the resemblance to his rescuer. Nevertheless, she is invited to the castle and given a warm bed and place to stay. An unlikely contrivance I suppose but it works! She is invited to dinner with Prince and Grimsby but first we get a little comic relief when Sebastian accidentally stumbles into Chef Louis kitchen, a kitchen hard at work cooking “les poissons’ or little fish. My brother took a french immersive class and a teacher used the word ‘les poissons’ and immediately a chorus of girls started singing the cooks song. It is hilarious slapstick and doesn’t have much to do with the story but I love it! It gives a break from some of the schmaltzy romance and very funny vocal performance by Rene Auberjonois. Ursula realizes things aren’t going her way so she uses Ariel’s voice and becomes human to trick Eric into marrying her. She actually has hypnotized him with yellow eyes. 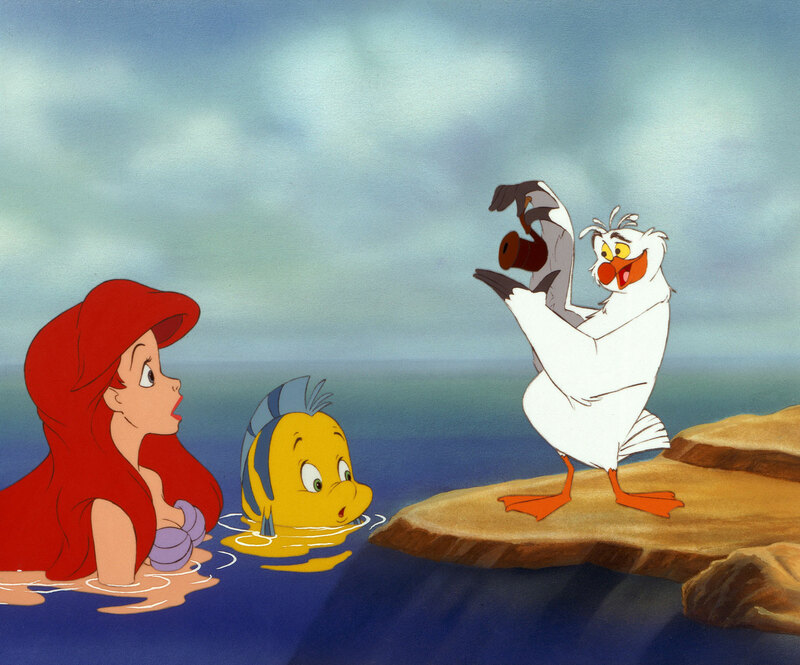 Ariel, Sebastian, Flounder and Skuttle all gather together to help stop the wedding and it is a funny yet tense scene. The battle between Triton and Ursula isn’t a wizard’s duel for sport. It is a battle of good vs evil, of bitterness and revenge with the fate of the sea at stake. The tension builds so well and it feels pretty desperate and that Ariel has lost her love and her father all at the same time. What can be done if even Triton is under Ursula’s control? Then Eric comes through and we get our amazingly drawn final battle. Another person I read said Ariel doesn’t learn anything by the end. I disagree. She does learn that chasing your dreams requires sacrifices and that love and family are precious. She learns she is where she is supposed to be. That is huge. But her father also learns. He learns HE WAS WRONG That’s why he changes her in the end. He was thwarting his daughters destiny and he made it right. So, lessons are learned and it is not a lesson that whining gets your way. At least that’s not what I have ever taken from it. It’s that we need to fight for what we are supposed to be in life and that is more important than anything else for both Eric and Ariel. We get our happy ending! It probably goes without saying this movie gets the highest grade from me. It has everything you want in a Disney movie. The animation is stunning in it’s detail, artistry and light. The songs run the gambit from heartfelt to hilarious. The characters are complex and relatable, even the Prince. The story teaches important lessons to girls (and boys I suppose) about finding out who you are and where you belong in life and fighting for it. It has the classic father/daughter dynamic that goes back to King Lear (and further I’m sure). The villain is unlike any we had seen before with a villain song that has yet to be topped. The score clips along and speaks for a character who for a majority of the film cannot. The songs are all instant classics. Every choice worked and it was magic to me as an 8 year old in 1989 and it totally holds up. I saw it 3 times this weekend and could have watched it 3 more times. Just like Frozen is doing for modern girls, Little Mermaid inspired many from my generation to be yourself and to sing your heart out. Just like girls are singing Let it go, we were singing Part of Your World. My sister and I would have competitions at night both of us claiming that we sounded the most like Ariel. (It was me all the way). I get that it strays from the classic story, but I think if Hans Christian Andersen saw the treatment of his work he’d be thrilled (and with Frozen too!). It certainly keeps the spirit of the story without punishing Ariel for dreaming big. I have nothing bad to say about it. I love it and can’t wait till the day I can gather my daughters (if I ever marry) and watch The Little Mermaid together and hear about all their desires, frustrations and dreams, and to sing with them! PS The sequels that are usually terrible by Disney aren’t half bad for Little Mermaid. There is actually a prequel and a sequel. Good review! I like this movie, but it was never a favorite of mine. And sorry, I’m in the camp who doesn’t like Ariel because she’s too stubborn, rebellious, and rude…especially to hear father. But, I like everything else in the film about her. I’m glad you enjoy Little Mermaid even if it isn’t your favorite. Most teenagers I know arent that djfferent than Ariel. It’s a searching maybe slightly bratty time. But that’s fine I’m glad you like the movie. I guess I’m more of a guy who likes seeing main characters in films that one can take as role models, rather than main characters that represent what people are realistically. I can only speak for myself but growing up she was a role model because she figured out where she belonged in the world and then fought for it. Belle is perhaps better because she is educated but I never felt Ariel gave me license to complain more just dream. Yeah, I want to get married too. But you’re right, God’s timing can be tough. Anyway, I wouldn’t say I liked this at least as much as say Lion King, but I enjoyed it nonetheless. I bought the Diamond Edition that came out last year. Watching it again, it’s definitely better than I remembered. I give it an A. So, you mentioned in your review that you heard another reviewer say that Ariel doesn’t learn anything. Just out of curiosity, was that reviewer the Nostalgia Chick? I just got the blu-ray and love it! The special features are fun, which usually they are lame for Disney but Little Mermaid and Beauty and the Beast are great. 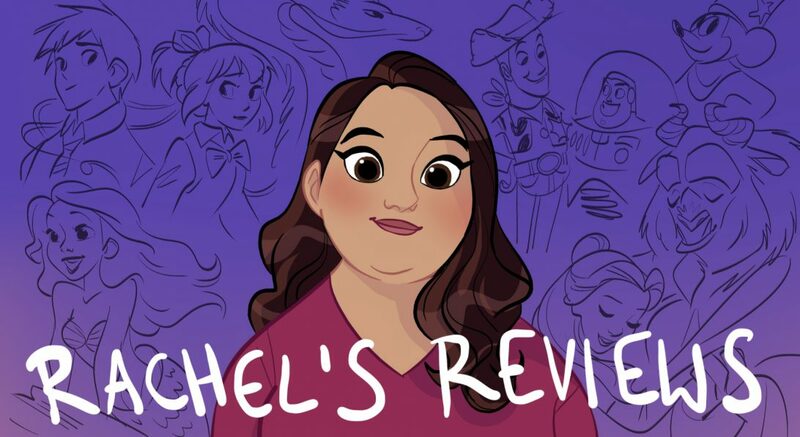 I hear the Ariel complaint around but have heard the Nostalgic Chick review. I’m not the biggest fan of hers. She’s so critical it’s exhausting without being funny like Nostalgia Critic. But I really don’t see their concerns. I watched Little Mermaid to death and it didn’t make me selfish or rebellious. I love the story!. So true, God’s timing can be tough. But I that’s why we trust Him, right? Anyway. Great review, and I really liked how you backed up your statements. The story is great, most of the characters are great, the soundtrack is BRILLIANT, and while the animation is good, I am glad the CAPS system was introduced. I just can’t like Ariel, or really relate to her that much. And CAPS is stunning! I was thinking about that watching tarzan how beautiful everything looked. Pingback: Watchmojo Best of Animated Series | Reviewing All 54 Disney Animated Films And More! By the way, after watching it more recently last year, I’d say you’re absolutely right. 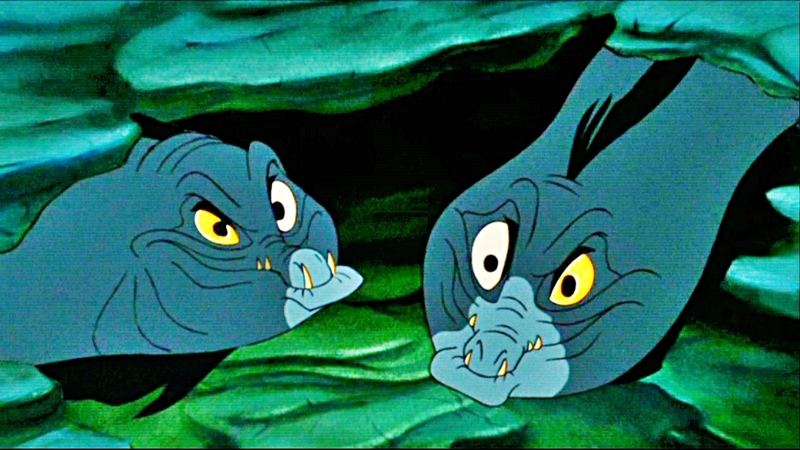 The eels are basically the snake in the Garden of Eden and Ursula’s the Devil. Wow, don’t most great stories have great symbolism, eh? Anyway, I’d say that while she was nicer and more innocent in the series, her story in the movie is in a league of its own. But when I got older, I started to find her more “teenage urges” like rushing to meet a man she barely knew less charming, something that didn’t gel with my initial impressions of her. My only problem with her, and to an extent the film, is that I wished we had gotten more a sense that she’d really grown as a result at the very end. You bring up a good point of there being a good lesson by the end, but I fear it might be too rushed. Unless of course you feel differently? 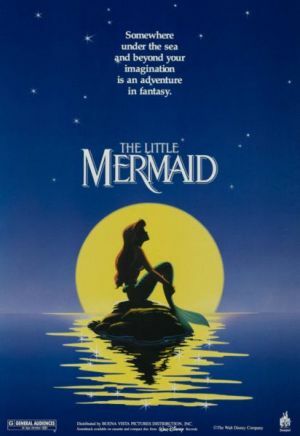 So while I do occasionally question Ariel’s characterization in both the series and the movie, I truly believe ‘The Little Mermaid’ is to the late 80s what ‘Snow White’ was to the 30s; a revolutionary animated musical that put Disney on the map in a big way, inspiring a whole new generation and hopefully more to come; beautiful animation, sweet comedic scenes, vibrant colours, versatile songs, fun characters, and solid story. It’s ironic that while modern audiences think the romance is rushed and the couple compared to more recent pairings, but in the 80s this was radical! I may not relate to all of the personal points you raised, but I completely see how others may feel as you did, and hopefully more people realize that Ariel isn’t rewarded for her whining but for realizing that she has to sacrifice in order to fully grow up. Vive ‘The Little Mermaid’!!! Thank you so much for your comments. They are always so brilliant. I haven’t heard of that miniseries! Funny it introduced you to Little Mermaid. I think with Ariel it wasn’t as much Eric but just a feeling of belonging. She says ‘how can a world that makes such beautiful things be bad?”. Eric was kind of the final cherry on top for her. She’d do anything to get up there and she’s young so they tend to fall fast. The ending might be a little rushed. That’s a good point. Once again, great to hear from you! It really is important that people do attempt to understand that her love for the human world preceded her love of Eric, who was probably not the only impetus for wanting to become human. And of course when she’s on land, she’s practically in heaven, tinkering with all the human gadgets and gizmos around her. It stands to reason that ‘The Little Mermaid’ still resonates with people today seeing as it has remained a household name since 1989, which is no small feat! Being the huge ‘Little Mermaid’ fan that you are I would have thought you’d have heard about the series! If you’re curious, here’s the episode episode I was referring to, but bear in mind the animation is not to as high a standard as the film and is overall lighter in tone. But it still has Jodi Benson, Kenneth Wright and Samuel Wright as Ariel, Triton and Sebastian respectively. For what it is, I don’t think its bad at all. Let me know how you felt about it! I hope girls are still seeing it. It’s funny when Little Mermaid gets brought up amongst women my age there is an immediate response like no other movie I can think of. People start singing Les Passions or Under the Sea. I’ve been in groups of colleagues from work where that happens. It just was such an epic movie. 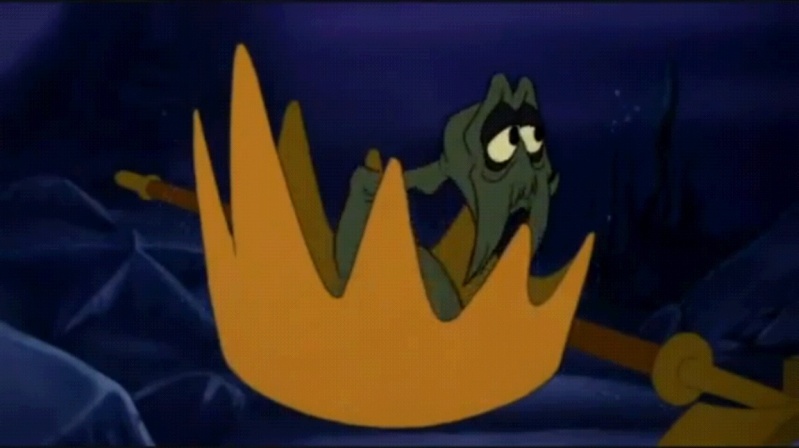 I think part of it with Little Mermaid is we hadn’t gotten a princess movie since Sleeping Beauty. It felt new and exciting! And really the Disney films of the 70’s and 80s were quite grim and sad. For example, The Rescuers and Return to Oz were both terrible experiences for me at the theater. So to see Little Mermaid was extra exciting. I know I need to get with it on the series! I own the sequels and thought I was pretty up on all things Little Mermaid. Will definitely watch. With Little Mermaid I think we all have movies that are epic in our lives. They may not technically be perfect but they are perfect to us. Pingback: Movie 56: Moana – Reviewing All 54 Disney Animated Films And More!